A story I wrote about McKinney artist Lisa Raymer ran in today’s Guide section of The Dallas Morning News. For nearly 20 years, Lisa has decoupaged floors and other surfaces in homes and businesses around Dallas. I was skeptical before seeing her work, but now I am a believer. It’s hard to tell in that tiny photo above, but the end result has a soft, textured appearance. This finish would look appropriate in many situations, and it has a high end look. A lot of faux finishes aim to have those qualities but miss the mark. I hope to do some decoupage soon and may try out using brown paper as Lisa does. Daffodils, originally uploaded by espeedy123. 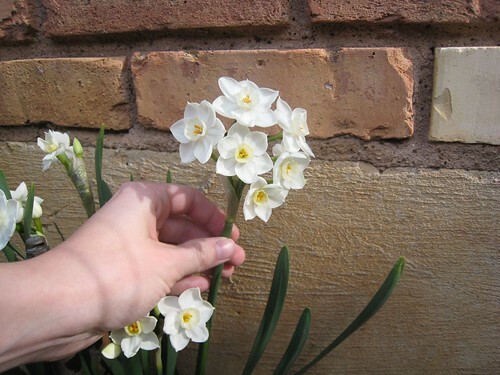 The daffodils along the southwest side of my house are blooming! In the past few months I’ve acquired some great old lamps. Two pair came from an estate sale, one from eBay, and a couple from the Habitat ReStore. I’ve become quite a lamp lady, but only if they need fixing it seems. In my quest to rehab them I’ve learned quite a bit. 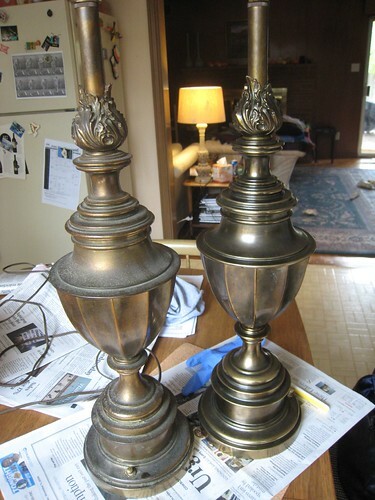 Lamp tip 1: Use WD-40 to clean up non-brass metal lamps. My favorite Dallas lamp parts shop is Royal Touch Lamp and Fixture Service, and the folks there told me that most old Stiffel lamps (including these) are not brass, as many people believe. Instead they are made from high-quality, heavy zinc plated with brass or some other metal, which is then antiqued and lacquered. As such, they shouldn’t be polished with brass cleaner because that would ruin the finish. The Royal Touch experts said to use a soft rag with WD-40 as a solvent to clean the surface without removing the patina. That suggestion was easy and worked great. These were $10 each and look quite nice now. In the photo below, the lamp on the left hasn’t been cleaned, and the one on the right is after cleaning with the WD-40. These came from an estate sale in Amarillo and were $10 each. You can tell they were made by Stiffel because they have metal tags along the top of the socket. The three-way switch is on the base of the lamps. Base switches are surprisingly superior to those on the socket. They save time and arm motion, so if you find an old lamp with a working base switch I think it’s worth a premium. Beyond surface cleanup all these needed were new shades. Unfortunately that can be an expensive proposition. Tip 2: Become a savvy shade shopper. Bring your lamp with you when shade shopping. Start with premium lamp shade stores to get an idea of what you want, and try on as many shades as you have patience for. The shades on these lamps are the box-pleat silk shade in size F from Restoration Hardware. They were expensive ($80 each! ), but I thought they looked really great and decided to splurge since the lamps sit prominently in my living room and are visible from the street. It irks me now to see they are on sale for $54.99, but they still make me happy every time I turn them on so I suppose I can live with my full-price lamp shade guilt. I’d love to hear comments on where you buy shades! Perhaps I am need to add some places to my list. Next up will be a post on solid brass lamp rehab. For two years I lived right off Union Square Park in Manhattan, where this guy named Joe Ades sold his vegetable peelers at the green market. Michael shot this little video of him when we returned for a visit. Today I read his obituary in the New York Times. Apparently quite a few people found him interesting. 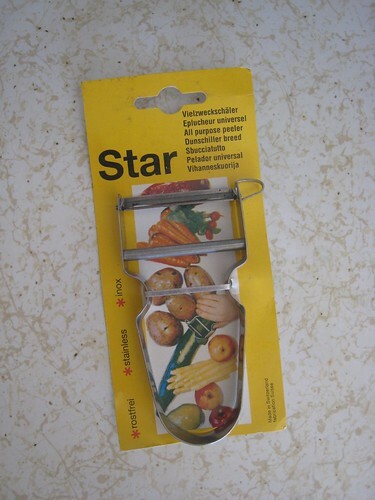 I bought a peeler from him, which I found today in my kitchen drawer. Kent’s Beauty Oregano, originally uploaded by espeedy123. I had some family over this weekend, and to dress things up I went hunting for flowers for the house. I really like potted arrangements because they last so much longer than cut flowers. Live plants seem much more economical. One plant I found is this crazy exploding mass of light green leaves with pink-lilac flowers. Would you believe it’s oregano? 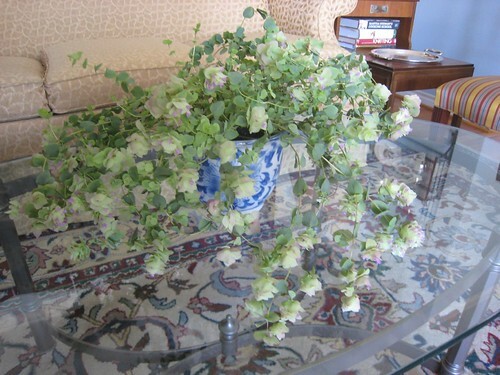 This variety is called Kent’s Beauty (origanum rotundifolium). It doesn’t have any of that weedy, woody, herb-y thing going that its more common cousins do. I bought it at Nicholson-Hardie on Lovers Lane in Dallas. I think they have the best indoor plant variety of anyplace I’ve seen here. And surprisingly, it was in the indoor plant area that I found it. This oregano can be grown outside like any other herb, and I plan to move it somewhere this spring. I think it would look lovely in a container arrangement or maybe spilling over some rocks.